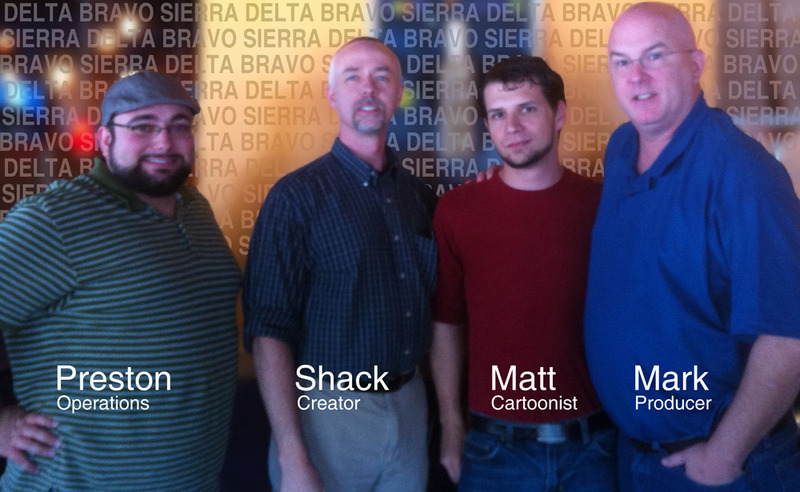 Shack has had the support of his friends, family, and readers from the start. Even with that assistance, DBS simply got too big to be run by a one-man shop. In mid-2012, the amount of work to be done began to outweigh the number of hours in a day. Shack had to call for fire support. Since then, he has pulled in some permanent assistance to help him write, draw, and manage the strip. Here is the team as it stands now. We are unified and ready push DBS forward together. Damon earned his Bachelor of Fine Arts degree concentrating on both drawing & painting then earned a second degree in chemistry and is an inventor on over a dozen United States Patents in Polymer Science. The DBS cartoon was his way of giving back to the Army that gave him so much. He now primarily serves the strip in an advisory and networking capacity. A graphic designer by trade, Matt is a graduate of the Art Institute of Atlanta. As of August 2012, he has taken up the pen as the cartoonist for DBS. He is also a writer for the strip. Public affairs, social media, internet marketing, and “run around like a crazy person” guy. Preston handles a lot of the day-to-day work at DBS and he also writes for the comic. Mark is a retired Army Command Sergeant Major and the owner of Mentor Enterprises, the company that publishes DBS. Mark handles the business and legal junk for the strip. He is also an endless well of inspiration; his war stories make it into the comic on a regular basis. A 6 year Air Force Veteran enlistee, Tim is a Staff Sergeant with experience in signals, photo intelligence, and computer programming. He has trained at joint military schools with the Navy in Colorado, the Marines at Quantico, and the Army at Defense Acquisition University. Tim is a 23-year veteran of IT for a major Aerospace firm. He is father to three sons who are in JROTC, in ROTC, and a Captain in the Air Force respectively. He is husband to one understanding and long-suffering wife. Tim is a voracious reader of all media, a lover of technology, and a story teller supreme. His favorite fictional military character is Don Rickles the Supply SSgt Crapgame in Kelly’s Heroes. The lead developer for the MilitaryToons.com network, Cameron is a fiend for new media and web applications. You’ll never see most of the cool things Cameron does (aside from everything in front of you). He is the wizard behind the curtain. A dry sense of humor, a high set of standards, and a wide knowledge of internet culture. This is what Tim brings to the table. Though a software developer day, many of the gags that show up in the strip and on Facebook slide across Tim’s desk before they go live. Everyone needs a good sounding board. Blogger and advocate of all things veteran-related, Greta is a long-time friend of DBS and a military spouse. She is the owner of Kickify, a company that offers all sorts of web marketing services. If you need your company to get noticed on the web, talk to Greta.